Topps first entered the trading card market with this 1948 Magic Photos set of small white cards that kids developed from "blank" to "sepia photo." To start the process, they'd wet the blank card and expose it to light; "water + light = development" for its invisible ink. I bet the chemical process was exciting for 1940s kids to see unfold, a little like how excited I got watching Polaroid photos reveal themselves in the 1970s. This unwrapped penny-candy size is the most common Magic Photo wrapper and includes developing instructions. Most kids would've use spit and sunlight. 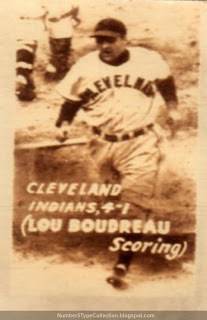 My #5 type card is HOF Indians player-manager, Lou Boudreau, crossing the plate. In 1948, Boudreau won 1948 AL MVP for his playing skills and managed Cleveland to the World Series championship over Boston's Braves. Not sure if it played into the set numbering, but Lou wore #5, now retired by Cleveland. 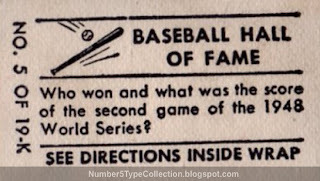 The card front answers this question: Cleveland won the game, 4-1. As noted by Wikipedia, this also marked the first live TV broadcast on a moving train. "K" is Magic Photo's baseball subset; I borrowed the full list from Topps Archive. 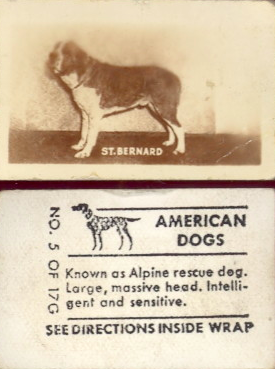 For subset comparison, here's American Dogs #5. UPDATE: Topps also created a storage album with checklists for the full series, scans from this eBay listing. 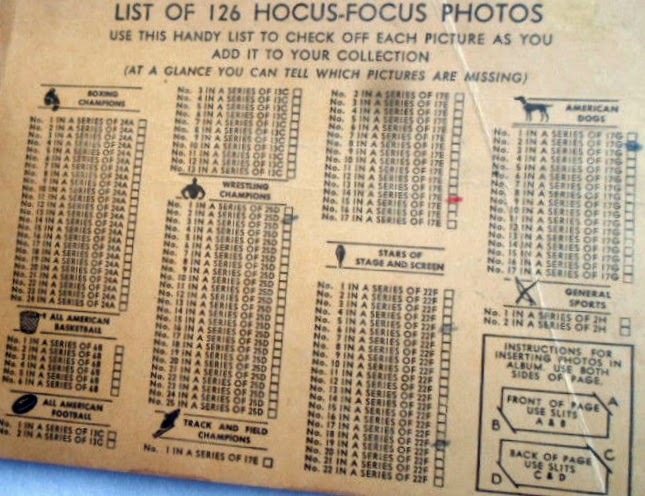 Their second checklist is typeset differently as the "New Series of 126 Hocus Focus Photos," so an earlier version with just series A-G might also exist. Topps would return to this Hocus Focus format for another two-part series in 1955 and 1956; that set's #5 is Ted Williams. Fakes / reprints: It'd be challenging but not impossible to fake this set expertly, so it's worth sticking with well-known dealers if you plan to buy big names.